To be honest, when my husband and I read about FaceBook founder Mark Zuckerberg taking his newlywed bride to McDonald’s during their honeymoon in Rome, we were not impressed. Why, oh why would anyone with a net worth of 35.1 billion opt for a McDonald’s coffee when there were a handful of cafes within arm’s length that were serving genuine espresso? Even myself, with a significantly lower net worth, am gladly willing to spend the five euros it takes to indulge in Italy’s finest ambrosia instead of coffee that I can easily get at home. Further, who would choose a cheeseburger over authentic Italian cuisine? 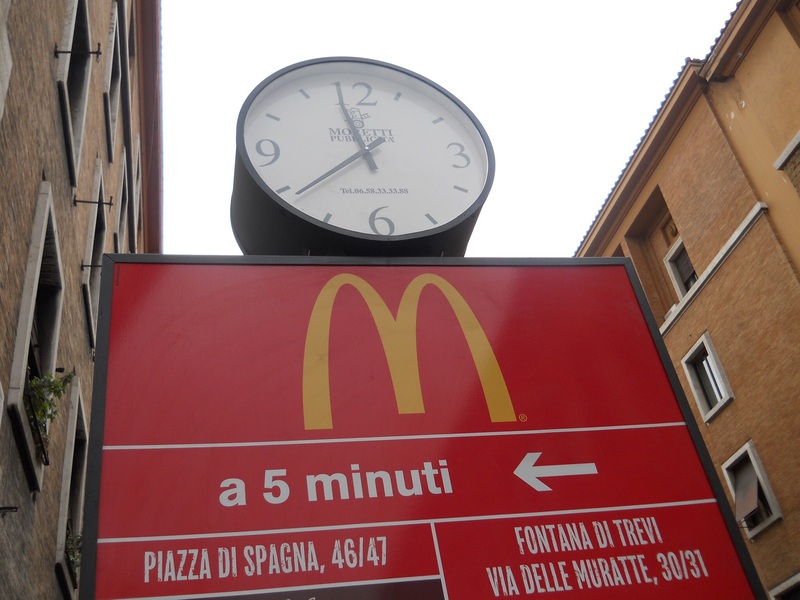 We had come across a McDonald’s during a trip to Rome in 2008. It was immediately opposite to the world’s oldest church, the Pantheon in the Piazza Della Rotunda. We had no desire whatsoever to venture in for a snack when we had sidewalk cafes at every turn. After reading the article, I concluded that it would be highly unlikely that I would ever find myself at a MacDonald’s in Italy. Well, as fate would have it, during our next trip to Rome, not only did I eat at MacDonald’s, I was also very grateful that I had the opportunity to do so. It was a cold and rainy day that made us walk through a McDonald’s door next to the Spanish Steps during our visit to Rome in December 2012. Who would have thought that they would build a McDonald’s in one of the most prestigious shopping districts in the world? Earlier that day, our taxi dropped us off at Piazza del Popolo at about 10:00 a.m. It never stopped raining. After about an hour we were drenched. That’s when my husband spotted the Golden Arches and suggested we warm up and get dry while having something to drink before continuing on our schedule. Since it was only just past 11:30 a.m., we didn’t have an appetite for lunch. All we wanted was a warm, dry place to sit, collect our thoughts and regroup. Why spend sixty euros on a meal when you only need a drink and a quick bite? Once we entered the establishment, we were pleasantly surprised at the restaurant’s chic textured interior of white, grey and ecru. It was huge. Had it not been for the lit up display menus, I would have never thought I was inside a McDonald’s. My daughter and I sat down at what looked like a marble table, and tried to take in the trendy atmosphere. After a few moments my husband sat down with cokes and some fries. The fries were incredible. They were hot, perfectly fried, and with no oily aftertaste. Even the salt was perfectly meted out. The fries disappeared one by one as we poured over our collection of city maps trying to figure out how to continue on without getting drenched in the rain. By the time we were ready to leave, we were warm, a little drier, energized and in better spirits. The object lesson for me here was the importance of being open to situations as they present themselves. Thanks to a very rainy day, I learned that all McDonald’s are not the same. Further, even though I had no desire to visit an American fast food chain in the heart of Rome, I learned that I can enjoy myself just about anywhere I find myself, as long as I make up my mind to do so. On the day that Lady Diana married Prince Charles in July 1981, we were visiting my Mother and Jim in Vermont. My Grandparents were there as well. We all watched the wedding together. What I remember best about the royal celebrations is not the wedding gown or the church or the musical interludes. What I remember best is a statement made by the Archbishop of Canterbury who married them. That anyone can be a Prince or Princess. This week I received confirmation from my youngest daughter that she has chosen her wedding dress. She even sent me a photo. …and turning into a Princess. ….The same girl who used up my expensive face moisturizer when she was nine years old. When asked why, she stated that she didn’t want to look old like me. …The same girl who screamed in terror one morning just before leaving for school when I told her that she looked nice and how much I liked her outfit. She gasped in horror, screamed, then immediately ran upstairs and changed. Yes, I will grant my daughter one day’s leave so that she can be a Princess on her wedding day. However, this is to be for one day only. …as the hot pepper in my life. Imagine if you will, a warm and sunny day. I was out and about in the car for the afternoon when I noticed the bakery tucked away in a remote little corner of town. This bakery was precious to me as my husband worked there while we were dating. He drove the delivery van. At the end of his day the boss would give my boyfriend the go ahead to take home all the leftover pies and rolls to his Mother. Now it was twenty years later. It did not look like the same bakery from the street. Curious, I gave the rough exterior the benefit of the doubt. I parked my car and went inside. Before my eyes adjusted to the lower level lighting I was disappointed that I had not been met by the scent of fresh baked rolls. I then noticed that I was the only customer in the store. The only other person visible was a burly man leaning against a counter opposite from the cash register. His arms were folded across his chest. His grim face told me that I was welcome to leave anytime. This was not the atmosphere of a bakery. Boxes on the floor were crammed with strange paraphernalia that I knew weren’t cleaning supplies. Everything was layered with dust. About half a dozen rolls sat on a ledge behind him. I did not dare ask him how fresh they were. A single sunbeam coming in from a side window accentuated the swirling dust particles suspended in the air. They were obviously refusing to settle until they had found a clean place to land. The vats in the back of the store looked like they had been cooking something, but nothing that was for public sale. Before turning around to leave my eyes landed on three cheesecakes contained inside a dirty glass counter located at the opposite end of the store. The cakes looked strangely out of place. As I approached the cheesecakes, I noticed a hole in the bottom of the cheesecake to the far left. This hole was about the size of a quarter. I wondered if the shopkeeper had stuck his thumb in it to steal a taste. I was immediately proven wrong. In the blink of an eye, a small, brown mouse popped his head out of the hole that I had been studying. His eyes were bright and shiny. His fur looked exceedingly neat for just having been inside a cheese cake. The ends of his whiskers were heavy laden with cheesecake crumbs. Needless to say, this mouse looked very happy as we continued to stare at each other. Within fifteen seconds, I experienced emotions that went from shock, to revulsion, to disbelief, and then to amusement. And as quickly as the mouse had appeared, he suddenly disappeared back inside the cheesecake. He must have been right at the centre of the cake far from my view, because there was no trace left of him, no tail could be seen, no crumb laden whiskers. For about two seconds, I considered telling Mr. Stoneface about the mouse. But without a word, I turned around and simply walked out of the store. Certainly, this mouse, this incredibly lucky, audacious mouse would meet his demise all too soon. If not caught, he would indeed succumb to a fatal case of cheesecake poisoning. I cannot think of a more wondrous and imaginative way for a mouse to succumb to the inevitable. May we all be so fortunate. At first glance upon walking into this restaurant you’ll see a television perched up near the ceiling in a far corner to your left. The Rockford Files is on and if course, it’s in Italian. The walls are sporadically decorated with black and white photos, one of which is of Sophia Loren. 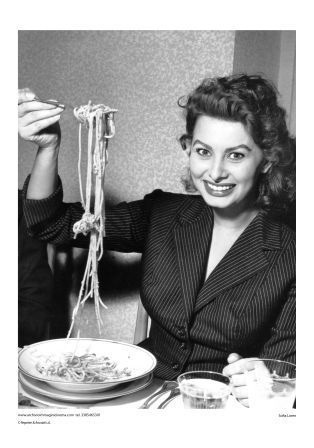 My favourite picture is the one where she is holding up a forkful of spaghetti. …but somehow I doubt it. The tables and chairs seem like leftovers from the sixties. So do the plastic menus. Down the wall to your immediate right is a buffet style counter that stretches down the length of the wall. It doesn’t look like much when you first enter the door. As you approach this counter to get a closer look, your eyes begin to dance as they focus in on the offered entrees. The spartan furniture and muted walls are immediately forgotten. Instead, all you can do is stare at the fine arrays of grilled vegetables in greens, reds, and golds…. Eggplant smothered in oozy cheesy goodness. And to wash it all down the house wine is served by the pitcher full, crisp, cold and white. If you find yourself in Rome, look up Cesar Ristorante Pizzeria on Via Venizia. Tell them Doris sent you. It’s worth the plane fare. When you take a day trip, usually the fare includes a lunch. And it’s not a bad lunch. 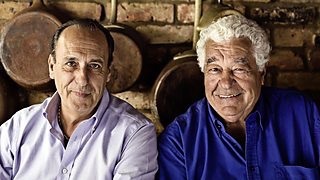 Having been on the Appian Bus Line tour to Naples and Pompeii four years earlier, we had learned what to expect when it comes to lunch, or in the Italian language… “pranza”. Located almost next to the Pompeii ruins, there is a very large hall that caters to all the Pompeii bus tours. At any given time, I’m sure that there are at least two hundred people being served, with a major capacity for about five hundred. Needless to say, it was a very busy place. When it comes to shuffling patrons in and out of the dining areas, the people who run this hall have it all down to a fine science. However, before your group is invited inside for their sit down meal, your tour guide obliges you to take a tour of a local merchants warehouse and shop. On our first tour, it was all about the cameos. The tour guide presented to you the artisans as they were plying their trade. Then you were encouraged to purchase similar items in their shop. Frank and I quickly learned where the back door was, and that was the end of that. On our second tour, the featured items were coral jewelry. You would be hard pressed to find anything less than one hundred euros. Again… We quickly located the back door. 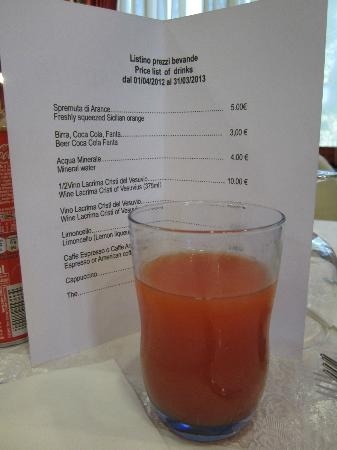 Looking back, we found the offered lunch mediocre to what were use to from the restaurants we frequented in Rome. However, this is one of the free perks when you pay 160 euros per person for a 16 hour day trip. Beverages however, you have to pay for with the exception of water. To me, this place had more the feel of a cafeteria rather than a fine dining experience. Our meal began with cannelloni, which arrived at the table still reasonably warm. And I am happy to report that my first experience with authentic Italian cannelloni was somewhat pleasant. More so than the pasta that followed, which struck me as your run of the mill pasta in tomatoe sauce. Then, we had a choice of seafood or roast beef. I was the only one at the table who was brave enough to order the seafood. The plate that was set before me displayed five pieces of calamari, and three prawns with little black beady eyes staring up at me from my dinner plate. And very dead ones too I might add. I was quite tempted to close my own eyes as I was eating. One of my most favourite movie lines ever, comes from one of the HIGHLANDER movies. It’s the scene, where the character played by Sean Connery is being offered an inflight dinner tray by a stewardess. All of my life, I’ve tried to never eat anything from the neck up. As far as the roast beef was concerned, I could not help but cast my eyes over to Frank and Jen’s plates as they were plated out before them. And suddenly, I didn’t feel all that bad. Their roast beef seemed to be sliced so thin that you could almost read a newspaper through it. At least, when we got to dessert, at last I found myself smiling. We were served a delicate portion of a very lovely sort of cream cake. Most sins were forgiven… but not all. Further, this time I opted not to indulge myself in a glass of wine like I did the first time around. The wine I had then was very good, Lachryma Christi, made from the grapes grown on Mount Vesuvius. Expensive at 7 euros a glass, but worth every penny. Further, it seemed a shame to indulge in such a nice wine when eating only mediocre food. And so, as far as that day’s luncheon was concerned…. …the bottled water did just fine. For a birthday surprise, my Mother had planned to take me to Stowe, Vermont where we would enjoy some nice German cuisine at the Trapp Family Lodge. After checking out their restaurant hours online, she printed out the luncheon menu and handed it to me. Certainly not the German entrees that we had expected, and certainly not worth the two hours it would take to drive there and back again. It was a three story old wooden building and as you walked across the floors they would squeak you old shanty squeaky sea songs. The walls, tables and chairs were painted in glossy bright nautical reds and blues. We sat at a table along the back wall that overlooked the lake with a Burlington ferry dock and marina in between. As the entrees were placed before us, we were handed our bibs. Mother put hers on, however I passed on mine. We commenced to smother ourselves in butter, garlic, lemon and a lot of tasty morsels of seafood ambrosia. 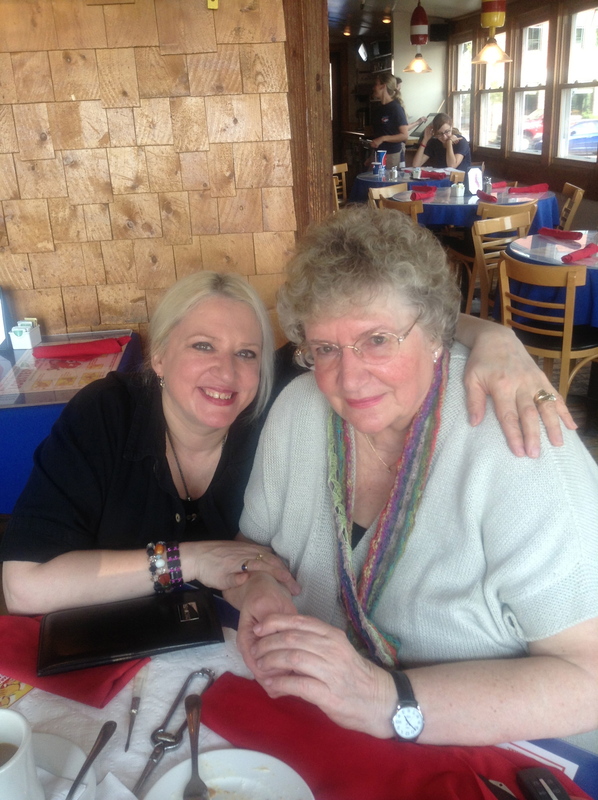 By the time our feast was over, we fell back into our seats with sated delight and…. … smiled at each other. We both agreed that passing up the Trapp family Lodge had been a good call. Believe it or not, Mother actually had enough handi-wipes in her purse to make us presentable to the public. I felt like a kid again as she pointed out the crumbs I had missed and brushed away the coleslaw from my blouse. It was at that moment that I was very grateful that there are some things that never change. As we exited this sea food shanty, she turned right as she headed back to the car, while I turned left so that I could take a little walk, and enjoy a few moments of life along the Lake Champlain shore. Maybe, I would even take a couple of pictures. …an empty parking queuing area for the Burlington ferry where Frank and I had gone through many times during our visits to Vermont. I enjoyed every moment knowing full well at this was my final day in Vermont before heading home tomorrow. And so ends my blog posts for this weeks journey to Vermont. It was very nice and peaceful visit.